So fellow travelers, a sudden thunderstorm filled the evening air heavy with cold damp air. 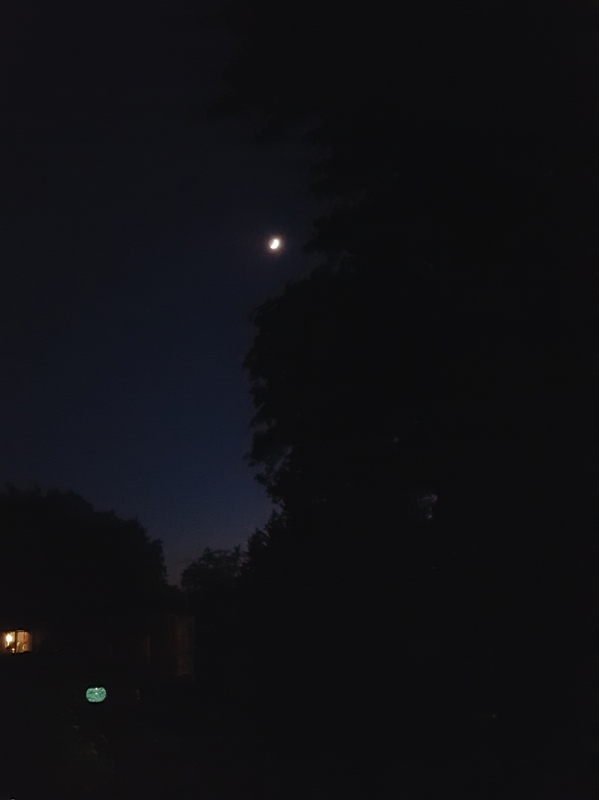 Stepping out for the last dog run of the night, I looked up and saw the waxing crescent moon rising above the big maple tree by our little pond. A tree frog’s evening serenade set this flow of words in motion. Sunday evenings have brought increasing heaviness as this challenging school year evolved. However, this extended holiday weekend provided much needed respite to help me reset my energies for the final weeks left. I have never been so glad to see a year come to a close. When it is finally done I will spend the summer building on some insights I have gleaned from the chaos. Forward. No need to look back. Onward to a path of greater Light. *Postscript: for those who inquired, the “floating” green sphere is a solar lantern with a green wicker exterior that hangs by our pond. The other two lights are a porch window and of course the crescent moon.